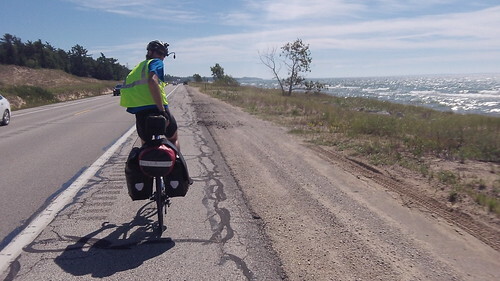 These panniers are rugged, waterproof, very simple to attach or remove from your bike rack. One of the first things I noticed about the Ortleib Rear Panniers was how simple the attachment and detachment process is. 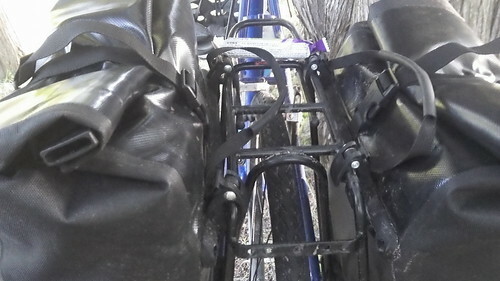 When lifted up, the rubber coated handles disengage the clasps holding the bags to your rear rack - likewise, when setting the panniers back down on the rack, you simply let it drop in place - no cumbersome velcro straps to loop around the metal bars, like I'd become accustomed to dealing with for other panniers. These bags are the industry standard for a reason - they are durable and definitely waterproof (as tested multiple times during the trip). I packed them slightly beyond their recommended capacity, and they held up fine. The high build quality of the hardware is obvious, and I felt confident not having to worry about attachment pieces breaking during rough sections of road. One disappointment was a few holes poked/scraped through the PVC coated polyester - I could have been a little more careful, but it did seem like one scrape against concrete did unwarranted damage. I'll be patching those small holes, and will continue to use the panniers regularly.